Official YouTube Blog: MyYouTube International Launch: eight new countries, featuring 142 local artists. MyYouTube International Launch: eight new countries, featuring 142 local artists. in Mexico, Los Autenticos Decadentes in Argentina, Malaika Arora Khan in India and 2pm in Korea. Plus, we’ve sprinkled in a few global artists from the U.S. contest as well (Rihanna, Justin Bieber and Selena Gomez... to name a few). In each international contest the artists compete to score the most points. And the only way they can score points is when YOU subscribe to their YouTube channels and share to your friends on Facebook and Twitter. By subscribing to an artist’s channel on YouTube, you get their latest videos delivered straight to your YouTube homepage, so you can easily stay up-to-date on their latest activity. To up the stakes even further, every artist (both local and global) is offering five prizes to five people who score points for them in the contest. All you have to do is sign-in to your YouTube account, go to youtube.com/myyoutube and click “Subscribe” and “Share” for your favorite artists! You can also watch the artists’ shout-out videos and discover other YouTube channels recommended by each artist. 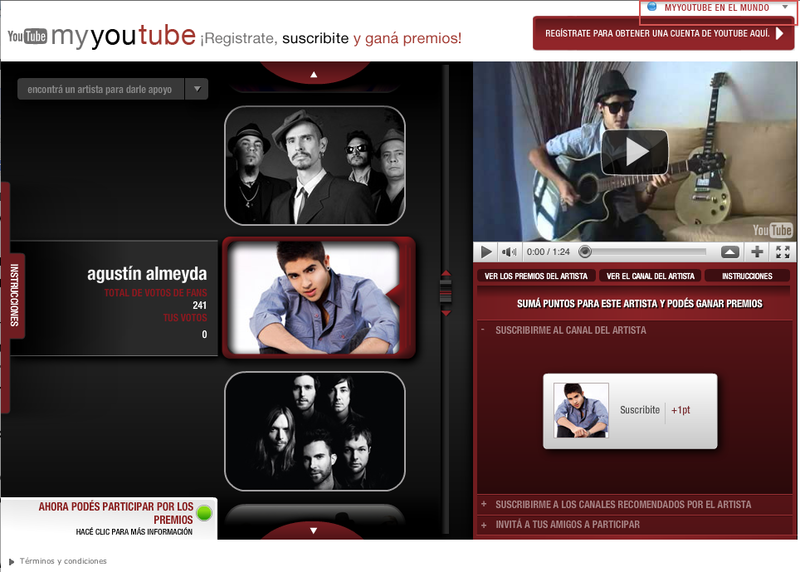 So head to youtube.com/myyoutube now and help your favorite artists win the MyYouTube contest in your country! After eight weeks of fierce competition, on February 16 we announced the winners of the MyYouTube U.S. contest. Christina Grimmie, Selena Gomez, Rihanna, Nicki Minaj, and Justin Bieber claimed the top five spots and received a special winner’s masthead on the YouTube homepage. Given the high level of involvement in the US program, we decided that MyYouTube couldn’t end there. So we ventured out to other countries to find their top local talent and get them on-board for a new wave of MyYouTube contests. And on Wednesday, the international competitions began. The MyYouTube Contest launched in eight countries (Argentina, Australia, Hong Kong, India, Japan, Korea, Mexico and Taiwan) and boasts a brand-new catalogue of local artists. Check out Zoe in Mexico, Los Autenticos Decadentes in Argentina, Malaika Arora Khan in India and 2pm in Korea. Plus, we’ve sprinkled in a few global artists from the U.S. contest as well (Rihanna, Justin Bieber and Selena Gomez... to name a few).